If you've applied to Kirkwood and already filed your FAFSA, the Kirkwood Financial Aid Checklist is a tool for you to determine where you are in the financial aid process. 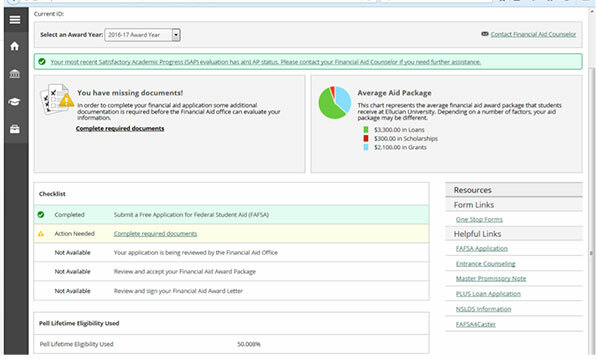 Submit the Free Application for Federal Student Aid (FAFSA) at www.fafsa.ed.gov as soon as possible after October 1. If you would like help filling out the FAFSA, please sign up here. Track your financial aid status at Kirkwood by logging into MyHub and clicking "Check Status" in the financial aid section. Review your checklist for additional requirements. Activate or decline your loans by completing that step on the financial aid checklist. Please ensure that you have loan funds for the terms you will be attending. This would include fall, spring and summer, if applicable. If you activate your loans, complete the Department of Education's entrance counseling and Master Promissory Note (www.studentloans.gov). Sign up for Direct Deposit through EagleNet. If an amount remains after tuition and books are paid, it will be sent once your attendance is verified. If you choose not to sign up for direct deposit, your refund will be mailed to you at the address on file. Refer to the Important Dates Calendar to check pertinent financial aid information for the current term.